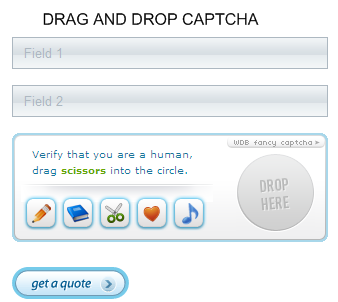 CAPTCHA (Completely Automated Public Turing Test to Tell Computers and Humans Apart) is used widely to prevent spam.CAPTCHA’s have been broken by spammers whenever a new implementation of the CAPTCHA is made by many web services to abuse it, with the recent being Microsoft’s Live Hotmail services ( Source – Websense SecurityLabs ). AJAX Fancy CAPTCHA is an interesting way of implementing CAPTCHA in an intuitive way, it requires the user to drag and drop specified item into a circle.Check out the demo on their site. The Captcha’s security level is medium,but definitely new idea for better CAPTCHA implementations.